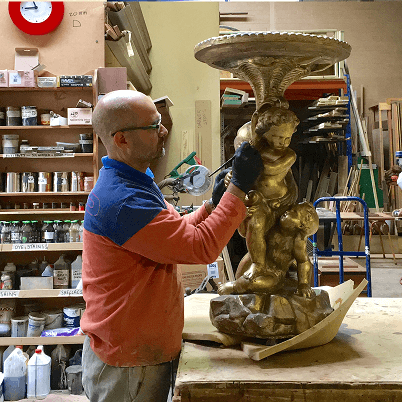 We tackle many different projects here at Antiques Restoration Centre, as shown here Massimo works on repairing an ornamental table that has been damaged. Here are some images from before and after. If you have any queries about something similar that you’d like us to repair or would like a quote for a project similar to this, please email us some images or bring the item down to the workshop to be assessed. Before; notice that the finish on the table has aged and there is damage to the foot of the statue. After; the whole item has been cleaned up, repaired, and re-finished to maintain the original lustre.